"To witness to our Christian faith by sharing the love of God with all, through worship, mission and service". 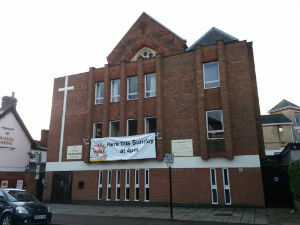 Trinity is a Town Centre church, which welcomes a 50 plus congregation on a Sunday morning. Everyone is welcome. Creche facilities and activities for older children are available on Sunday mornings. Our minister leads worship a few times each month. Holy Communion usually takes place on the first Sunday in the month. Otherwise worship will be led by a visiting minister or local (lay) preacher. After worship we meet for refreshments and fellowship in the hall downstairs. NEW! From Wednesday 3rd April at 10:30am, there will be a short service in the Coffee Lounge, which will include the act of Holy Communion. This will take place on the first Wednesday of every month. Please do join us as we share in this special time. We have a range of activities during the week and various types of community involvement as we seek to love and serve Christ together. Please see "What's On" and "Regular Activities" at Trinity on our website. In "What's On" you will find links to some of the groups who use our church premises during the week for more information. Trinity Methodist Church is a Fairtrade Church. This means that all tea, coffee and sugar we use at coffee after Service on Sunday and at our Wednesday Coffee Mornings should be Fairtrade produced, and we aim to use as many other Fairtrade products as possible. Our existing House Groups have been meeting fortnightly. Both have been growing recently, and we would like to double the number available to members and friends of our Church. On Tuesday 12th February the Springfield House Group held its last meeting in its traditional form, an opportunity to share fond recollections of meeting together down the years. Numbers have grown so much that we needed to split into two. From 26th February, there will be a Tuesday Evening Group led by Rev Vaughan Tong. Starting on 26th February, there will be a Thursday evening Group led by Rev Val Spencer. Our Monday Morning Eastgate House Group, led by Josie Keys and David Wakeford, is now almost full. We therefore started an additional day-time House Group, which meets on Trinity Church premises on Thursday mornings, 10:45am for 11:00am and led by Rev Vaughan Tong and Rev Val Spencer. We are currently studying the 2019 York Course, which we hope will help us in our thinking as a Church in what is becoming an increasingly exciting time of opportunity. The theme is "Daring to see God now". 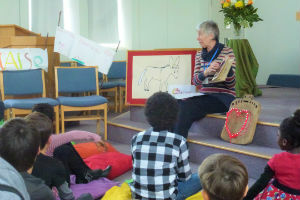 Messy Church witnesses to our Christian faith by sharing the love of God with families. It is Christ-centred, for all ages, based on creativity, hospitality and celebration. Found across the world (ours has a link with a Messy Church in Port Stanley in the Falklands! ), values are Christ-centred, for all ages and based on creativity, hospitality and celebration. Second Sunday of the month at 4:00pm with a break for Summer in August. This year Ascension to Pentecost runs from 30th May to 9th June, inspiring us to pray together and tell everyone about Jesus. Our May session will be centred on this theme, which will incorporate out Messy Church birthday and celebrate our 100th session on Sunday 12th May! 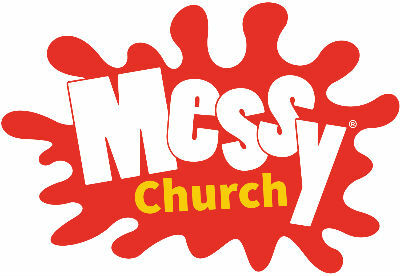 Messy Church took place again on Sunday 14th April, 4:00pm - 6:00pm. 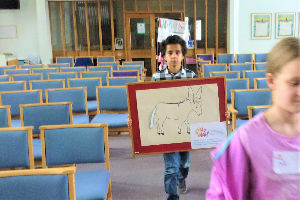 To mark the beginning of Holy Week, we celebrated Palm Sunday with Jesus' triumphal entry into Jerusalem, riding on a donkey. 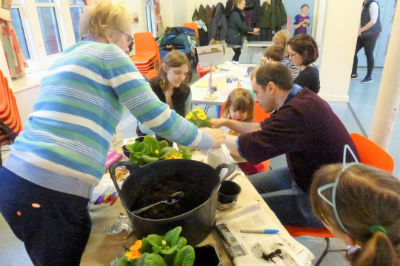 Our previous session took place on Sunday 10th March, when our theme was "Sharing is Caring". In Luke's Gospel, the crowds who were following John the Baptist were asking him how they should live. In Luke 3 v. 11 we read that "John answered, "The man with two tunics should share with him who has none, and the one who has food should do the same". A variety of Community Groups use our premises during the week. One of our principal users is Bury Drop-In Cafe, which offers free meals, drinks, advice and love to homeless and vulnerable people in Bury St Edmunds on Tuesdays and Fridays, 11:00am - 2:00pm. Click on the link to find out more! 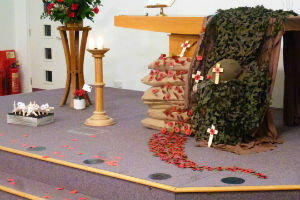 Trinity Methodist Church is a member of Churches Together in St Edmundsbury & District. The Bury St Edmunds churches have a strong tradition of working together in their worship and witness for Christ. On Good Friday (19th April), Trinity will be hosting a United Free Church Service at 9:30am with our friends from Whiting Street United Reformed Church and Garland Street Baptist Church, followed by the opportunity to participate in the annual United Procession of Witness starting from the Cathedral. Afterwards, coffee and hot cross buns will be served at Garland Street. "More In Common Than Divides Us" - Sunday 30th June - Afternoon - You are invited to the Abbey Gardens for a Summer Celebration. This will be a get-together of churches for a picnic, music, celebration and outreach. More information on the work of our local Churches Together can be found here.